Trump Designates Iran’s Revolutionary Guard a Foreign Terrorist Group – Royal Times of Nigeria. 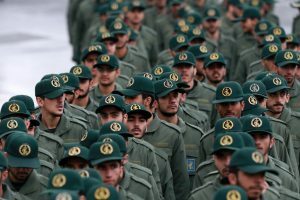 US President Donald Trump has designated Iran’s elite Revolutionary Guard Corps (IRGC) as a foreign terrorist organization. It is the first time the US has labeled another nation’s military as a terrorist organization. Washington-Tehran tensions have risen since Mr Trump withdrew the US from the international Iran nuclear pact. Labelling the Guards as a terrorist organization will allow the US to impose further sanctions – particularly affecting the business sector, given the IRGC’s involvement in Iran’s economy.